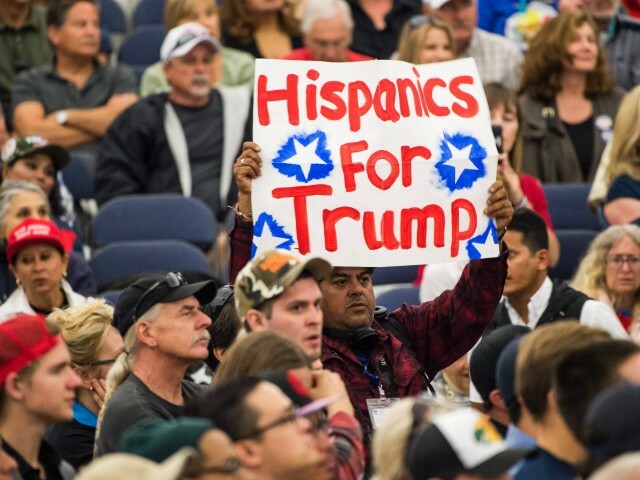 President Trump’s support among Hispanic American voters has soared as he is refusing to buckle to pressure from Republicans and Democrats to reopen the federal government without funding for his proposed wall along the United States-Mexico border. In the latest NPR/Marist/PBS Poll, about 50 percent of Hispanic American voters this month said they approve of the job Trump is doing in the middle of the government shutdown. This is a 19 percentage point increase from last month, when only about 31 percent of Hispanic voters said they approved of Trump. The poll revealed that since the start of the shutdown, Trump’s approval has barely changed among nearly all demographic groups. For example, Trump’s approval — since doubling down on obtaining border wall funding — with swing voters has hardly moved, with about 37 to 38 percent approving of the job he is doing between December 2018 and January 2019. The data does suggest Trump could be losing ground with white American voters for the administration’s lack of progress on the issue of immigration. Last month, about 50 percent of white voters said they approved of Trump. This month, only about 40 percent of white voters said they approved.